A large array of new stamps were issued by the Austrian Empire, during the period of 1914 to 1918, spanning World War I. These included Austria's first charity stamps and their first special delivery stamps. The aftermath of World War I would not only cause the breakup of the Austro-Hungarian Empire, but it would also see the final end of Hapsburg rule in Europe. The five designs, as they appear in the set, are as follows. Infantry firing from a trench. 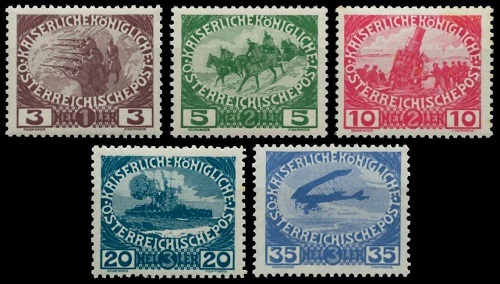 The fifteen wartime pictorial definitive Austrian Empire stamps shown above were issued in 1916 and 1918. They are typographed and perforated 12 1/2. The three common designs feature the Imperial Crown, Emperor Franz Josef I, and the Austrian Imperial Coat of Arms. The Michel / Scott catalog attributes, for stamps printed on normal paper, are as follows. 03 H. (1916 - Mi. #185x, Sc. #145) - Dark Bluish Violet. 05 H. (1916 - Mi. #186x, Sc. #146) - Dark Yellowish Green. 06 H. (1916 - Mi. #187x, Sc. #147) - Dark Red Orange. 10 H. (1916 - Mi. #188x, Sc. #148) - Dark Reddish Carmine. 12 H. (1916 - Mi. #189c, Sc. #149) - Dark Greenish Blue, Dark Turkish Blue. 15 H. (1916 - Mi. #190x, Sc. #150) - Dark Rose Red. 20 H. (1916 - Mi. #191x, Sc. #151) - Sienna. 25 H. (1916 - Mi. #192x, Sc. #152) - Dark Gray Ultramarine, Dark Lilac Ultramarine. 30 H. (1916 - Mi. #193x, Sc. #153) - Dark Prussian Blue. 40 H. (1916 - Mi. #194x, Sc. #154) - Brown Olive. 50 H. (1916 - Mi. #195x, Sc. #155) - Dark Opal Green. 60 H. (1916 - Mi. #196x, Sc. #156) - Dark Lilac Ultramarine. 80 H. (1916 - Mi. #197x, Sc. #157) - Dark Brownish Red. 90 H. (1916 - Mi. #198x, Sc. #158) - Dark Reddish Carmine. 01 K. (1918 - Mi. #199x, Sc. #159) - Lilac Red. The Michel / Scott catalog attributes, for stamps printed on thick paper, are as follows. 03 H. (1916 - Mi. #185y, Sc. N/L) - Dark Bluish Violet. 05 H. (1916 - Mi. #186y, Sc. N/L) - Dark Yellowish Green. 10 H. (1916 - Mi. #188y, Sc. N/L) - Dark Reddish Carmine. 40 H. (1916 - Mi. #194y, Sc. N/L) - Brown Olive. 50 H. (1916 - Mi. #195y, Sc. N/L) - Dark Opal Green. 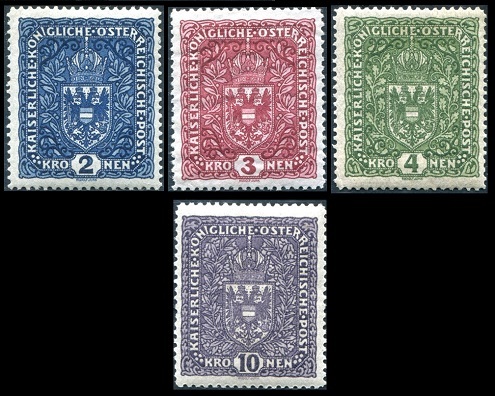 The four major-type high-denomination Austrian Empire definitive stamps shown above were originally issued on September 28, 1916, with additional printings continuing into 1919. These stamps are engraved on various papers, perforated 11 1/2 or 12 1/2, and they exist in two different sized designs. The Michel / Scott catalog attributes for stamps that are perforated 12 1/2 and that are printed on normal paper, are as follows. 02 K. (1916 - Size 25 x 30 mm - Mi. #200I, Sc. #160) - Dark Violet Ultramarine. 03 K. (1916 - Size 25 x 30 mm - Mi. #201I, Sc. #161) - Dark Brownish Carmine. 04 K. (1916 - Size 25 x 30 mm - Mi. #202I, Sc. #162) - Dark Olive Green. 10 K. (1916 - Size 25 x 30 mm - Mi. #203I, Sc. #163) - Dark Gray Violet, Dark Brown Violet. 02 K. (1916 - Size 26 x 29 mm - Mi. #200II, Sc. #160a) - Dark Violet Ultramarine. 03 K. (1916 - Size 26 x 29 mm - Mi. #201II, Sc. #161a) - Dark Brownish Carmine. 04 K. (1916 - Size 26 x 29 mm - Mi. #203II, Sc. #163a) - Dark Gray Violet, Dark Brown Violet. 10 K. (1916 - Size 26 x 29 mm - Mi. #203II, Sc. #163a) - Dark Gray Violet, Dark Brown Violet. 02 K. (1917 - Size 25 x 30 mm - Mi. #204I, Sc. #164) - Prussian Blue. 03 K. (1917 - Size 25 x 30 mm - Mi. #205I, Sc. #165) - Dark Lilac Red. 04 K. (1917 - Size 25 x 30 mm - Mi. #206I, Sc. #166) - Dark Yellow Green. 10 K. (1917 - Size 25 x 30 mm - Mi. #207I, Sc. #167) - Dark Brown Violet. 02 K. (1917 - Size 26 x 29 mm - Mi. #204II, Sc. #164a) - Prussian Blue. 03 K. (1917 - Size 26 x 29 mm - Mi. #205II, Sc. #165a) - Dark Lilac Red. 04 K. (1917 - Size 26 x 29 mm - Mi. #206II, Sc. #166a) - Dark Yellow Green. 10 K. (1917 - Size 26 x 29 mm - Mi. #207II, Sc. #167a) - Dark Brown Violet. The Michel / Scott catalog attributes for stamps that are perforated 11 1/2 or 12 1/2 and that are printed on granite paper, are as follows. 02 K. (1917 - Size 25 x 30 mm - Perf. 12 1/2 - Mi. #208IA, Sc. #172b) - Prussian Blue. 03 K. (1917 - Size 25 x 30 mm - Perf. 12 1/2 - Mi. #209IA, Sc. #173a) - Dark Lilac Red. 04 K. (1919 - Size 25 x 30 mm - Perf. 12 1/2 - Mi. #210IA, Sc. #174a) - Dark Yellow Green. 10 K. (1919 - Size 25 x 30 mm - Perf. 12 1/2 - Mi. #211IA, Sc. #175a) - Dark Brown Violet. 02 K. (1917 - Size 26 x 29 mm - Perf. 12 1/2 - Mi. #208IIA, Sc. #172) - Prussian Blue. 02 K. (1917 - Size 26 x 29 mm - Perf. 11 1/2 - Mi. #208IIB, Sc. #172a) - Prussian Blue. 03 K. (1917 - Size 26 x 29 mm - Perf. 12 1/2 - Mi. #209IIA, Sc. #173) - Dark Lilac Red. 04 K. (1919 - Size 26 x 29 mm - Perf. 12 1/2 - Mi. #210IIA, Sc. #174) - Dark Yellow Green. 10 K. (1919 - Size 26 x 29 mm - Perf. 12 1/2 - Mi. #211IIA, Sc. #175) - Dark Brown Violet. The two triangular-format Austria Empire special handling stamps shown above (Mi. #217-218, Sc. #QE1-QE2) were issued on October 1, 1916. These stamps are printed on yellowish paper, and they are all perforated 12. The two horizontal-format Austria Empire special handling stamps shown above (Mi. #219-220, Sc. #QE3-QE4) were issued on May 15, 1917. These stamps are printed on yellowish paper, and they come in four perforation gauges. The most common of the four perforation gauges are 12 1/2 and 11 1/2. Stamps of the other two perforation gauges, 11 1/2 x 12 1/2 and 12 1/2 x 11 1/2 are very scarce. 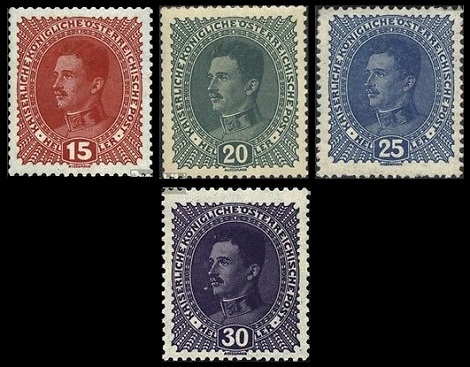 The four portrait definitive Austrian Empire stamps shown above were issued on May 10, 1917. These stamps are typographed and perforated 12 1/2. The common design features the portrait of Emperor Karl I. 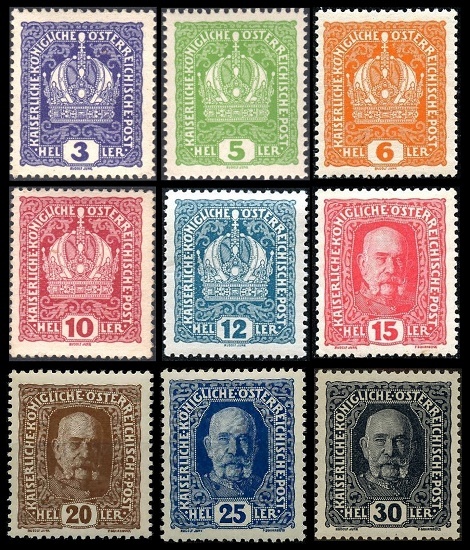 The Michel / Scott catalog attributes, for Austrian Empire stamps printed on normal paper with gum, are as follows. 15 H. (1917 - Mi. #221x, Sc. #168) - Brownish Red. 20 H. (1917 - Mi. #222x, Sc. #169) - Dark Blue Green, Dark Opal Green. 25 H. (1917 - Mi. #223x, Sc. #170) - Violet Ultramarine. 30 H. (1917 - Mi. #224x, Sc. #171) - Dark Blue Violet. The Michel / Scott catalog attributes, for Austrian Empire stamps printed on thick paper without gum, are as follows. 15 H. (1917 - Mi. #221y, Sc. N/L) - Brownish Red. 20 H. (1917 - Mi. #222y, Sc. N/L) - Dark Blue Green, Dark Opal Green. 25 H. (1917 - Mi. #223y, Sc. N/L) - Violet Ultramarine. 30 H. (1917 - Mi. #224y, Sc. N/L) - Dark Blue Violet. On November 12, 1918, the Republic of German Austria was proclaimed, and at that time, the Austrian Empire and the Hapsburg monarchy both came to an end. The two Austrian Empire portrait charity stamps shown above (Mi. #178-179, Sc. #B1-B2) were issued on October 4, 1914. Each of the stamps was sold at post offices for 2 Heller over face value, with the surtax going to the aid of wartime widows and orphans. The designs are similar to those of the same denominations of the 1908 60th Anniversary definitives, except the stamps are taller, to allow for the addition of a tablet containing the year-date below the portrait. 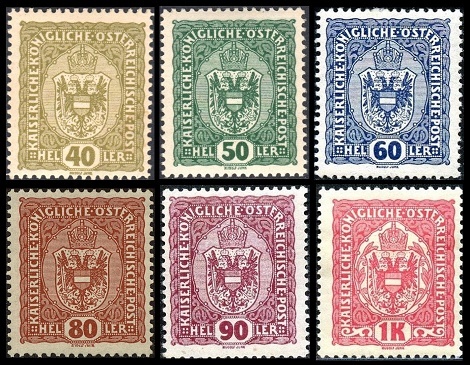 The five major-type Austrian Empire newspaper stamps shown above were issued on October 1, 1916. These stamps were issued imperforate, however they do exist with private perforations of various types. The common design features a modernistic, left-facing profile of Mercury. In June 1914, Karl's uncle, Archduke Franz Ferdinand, heir to the imperial throne, was assassinated in Sarajevo, Bosnia by a Serbian anarchist. This event resulted in the Austrian Empire declaring war on Serbia, the spark that, due to complex alliances at the time, would ignite a World War. At this time, the 27 year old Prince Karl Franz Josef was declared the heir apparent to the imperial throne. On November 21, 1916, Emperor Franz Josef I died, having reigned only a week shy of 68 years, the third longest reign in European history. On December 30, Young Karl was coronated as Emperor Karl I of the Austrian Empire and as Karl IV, the Apostolic King of Hungary. Though the commander of the imperial military forces and a capable military leader, Karl disdained the war, and in 1917, he entered into secret peace negotiations with France. The French, however, would have nothing to do with a peace arrangement that did not include the German Empire. At the end of World War I, on November 11, 1918, the emperor issued a proclamation, in which he recognized the Austrian people's right to determine the form of the state, and he relinquished his participation in the administration of the Austrian State, but HE DID NOT ABDICATE the throne. 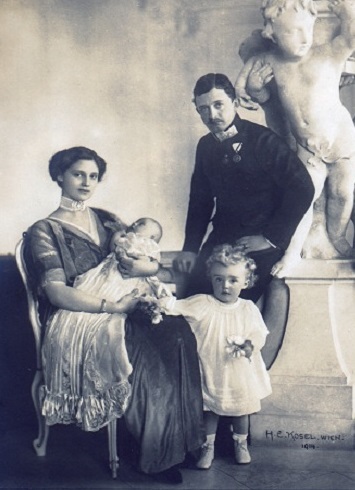 In March 1919, the imperial family moved to Rorschach, Switzerland, and in 1921, they moved to their place of final exile, the Portuguese island of Madeira. Karl spent the remainder of his life campaigning for the restoration of the Austrian monarchy, and after a lengthy illness, he died in Madeira on March 9, 1922. He is buried in the Church of Our Lady of Monte in Madeira.